Teaching Middle Years has established itself as the most respected Australian text to focus on the adolescent years of schooling. Recognition of the educational importance of this age group continues to grow as research reveals the benefits of programs designed especially for young people's needs. This third edition provides a systematic overview of the philosophy, principles and key issues in middle schooling, together with a new depth of focus on the emotional problems and behavioural challenges in working with students. The editors explore in detail two key areas in middle years pedagogy - differentiation and engagement - and there are new chapters on achieving effective transition, the importance of physical activity in adolescence, and how to develop cooperative and collaborative learning. 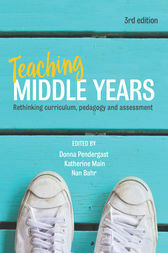 Featuring contributions from leading experts in the field, and fully revised and updated to reflect the latest research, Teaching Middle Years will assist both pre-service and in-service teachers to bring out the very best in their students.